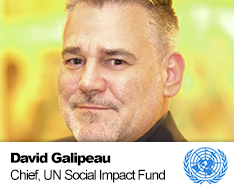 David is founder and Chief of the United Nations Social Impact Fund (UNDP-UNSIF), which brings together venture philanthropists, family trusts, foundations, corporations, governments and private sector investors to chart a new course toward creating a SDG-aligned ‘blended financing’ platform – balancing both social and economic returns. Prior to joining the UN, David held senior management positions within the strategy, digital and business development area with Top-3 global corporations, before becoming an ‘dotcom’ entrepreneur in the late 90’s where David founded three internet start-ups in – one failed (boo!) and the other two were successfully acquired in 2000 and 2001 (yay! ).